The Food and Drug Administration (FDA) recommends a pre-use check of the anesthesia machine before every single use. Even though it has been shown to improve 24-h severe post-operative morbidity and mortality, the pre-use check is not performed as often as recommended. When it is performed, many faults may go undetected according to various studies. 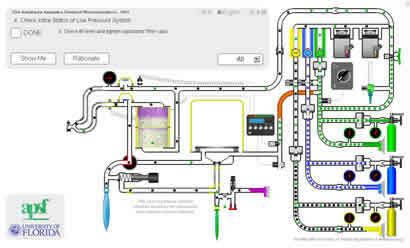 This curriculum based simulation uses learning objects to teach the 1993 FDA Pre-Use Check. This simulation captures user actions in a database. The user advances through the curriculum by seeing, doing and then being tested on each of the steps in the 1993 FDA pre-use check. Devlopment of this free simulation was funded by the US Anesthesia Patient Safety Foundation (APSF).